Our specially formulated pure essential oil blends are also available in convenient Spray for easy application and on-the-go use! These Spray are made with 100% Pure & Natural Carrier and Essential Oils, and come packaged in 2 oz. amber glass bottles with a spray cap. 1. Muscle Ice (Formally Aches & Pains): Ease muscle discomfort with an essential oil blend that is specially formulated to combat poor circulation and burnout following exercise. Ingredients: Grapeseed Carrier Oil, Jojoba Carrier Oil, Coconut Carrier Oil and Muscle Ice (Formally Aches & Pains) Pure Essential Oil Blend. 2. Easy Breathzy (Formally Cold & Flu): Promote better well-being and support the immune system. Ingredients: Grapeseed Carrier Oil, Jojoba Carrier Oil, Coconut Carrier Oil and Easy Breathzy (Formally Cold & Flu) Essential Oil Blend. 3. Lavender: Enjoy the benefits of the world’s most popular essential oil in a convenient Spray! 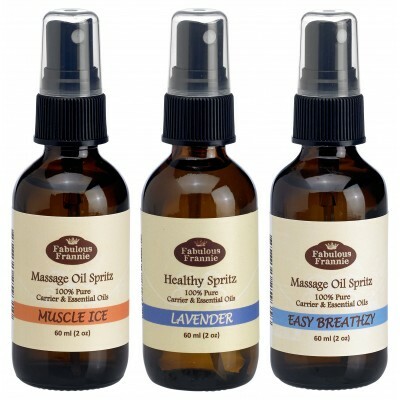 This Spray is formulated with naturally moisturizing carrier oils and pure Lavender essential oil. Ingredients: Grapeseed Carrier Oil, Apricot Carrier Oil, Avocado Carrier Oil, Coconut Carrier Oil and Lavender Pure Essential Oil.